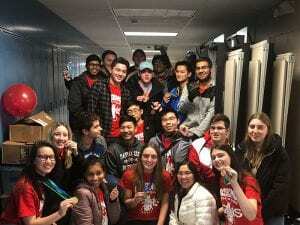 Tappan Zee High School’s Science Olympiad team placed 10th overall and medaled in eight events at the Lower Hudson Valley Science Olympiad Regional Competition at Byram Hills High School on Saturday! Forty-eight teams participated in the highly-competitive regional contest. Nearly all of this weekend’s medalists got their start on the South Orangetown Middle School Science Olympiad team. SOMS students interested in astronomy, biology, chemistry, earth science, building and/or coding are encouraged to check out the SOMS Science Olympiad team, which meets after school on Tuesdays and Wednesdays in Room 186. Rising ninth-graders and current freshmen, sophomores and juniors with a passion for science and engineering should reach out to Ms. Connington and Mr. Adler for information about joining the TZHS Science Olympiad team. More photos on Facebook!